This Best Chocolate Cake recipe makes for the most flavorful, moist, and tender chocolate cake you've ever tasted! Everyone LOVES it and you don't even need a mixer to make the batter. Download my free Buttercream guide here! Taste: Loaded with chocolate flavor and just the perfect balance of sweetness. Texture: Crazy moist, tender, and fudgy with the silkiest and creamiest frosting ever! Ease: The cake batter is crazy quick & easy. The frosting is a little more involved, but totally doable. Pros: Best ever chocolate cake… need I say more?! Would I make this again? Of course, this is already my go-to recipe. I have a confession to make. I’m not a big cake fan. As a professional baking blogger I know this is basically heresy. But I just find the majority of cakes out there to be either dry and bland, sickly sweet and artificial tasting, or so light in texture that I would rather have a brownie. Oh no, I could eat this cake weekly… for eternity! When this best chocolate cake comes out of the oven, the tops of the layers are actually shiny and slightly crackled almost like a brownie. That’s how fudgy it is. The cake batter itself is so crazy easy to whip up. You don’t even need a mixer for the batter. That allows you to focus your energies on the Chocolate Swiss Meringue Buttercream, which truly takes this cake to another level. You could totally have fun and get creative with flavors and fillings here as well. Maybe add some orange zest to the cake & frosting, some raspberries or jam to the filling, or some salted caramel for good measure? But sometimes there’s nothing better than pure chocolate indulgence. You’ll want to go totally Matilda on this cake! I hope you make this recipe for someone special soon! We can’t make the best chocolate cake without paying attention to the chocolate ingredients! The cake contains both bittersweet chocolate AND Dutch-process cocoa powder for as much chocolate flavor as possible. The frosting uses melted chocolate for the most intense and pure chocolate flavor possible. I like to use semisweet, but feel free to use milk or bittersweet chocolate. Just make sure you’re using the highest quality chocolate you can. Do I have to use Dutch process cocoa powder? Yes, I do recommend you stick with the Dutch-process cocoa as it actually works differently on a chemical level compared to regular natural cocoa. You can learn more about the differences between cocoa powders here. You can find it at many gourmet food stores, like Target, Whole Foods, Sur la Table, and Williams-Sonoma. I actually order a big container on Amazon because it’s such a great value! You may have seen a few chocolate cake recipes that utilize hot water or even hot coffee. When the hot liquid is combined with the cocoa powder, it helps to dissolve and ‘bloom’ the cocoa powder to bring out as much flavor with as few cocoa lumps as possible. In this recipe, I use a combination of hot water and instant espresso powder. The espresso simply enhances the chocolate flavor without actually tasting like coffee. Alternatively, you could use strong hot coffee for the same effect. I never have coffee on hand so for me, espresso powder + hot water is easier and cleaner. If you don’t like coffee or espresso, just use hot water. This recipe calls for vegetable oil instead of melted butter. Oil creates an ultra moist texture and open slightly spongy crumb. Cakes made with oil feel more “moist” because the fat is a liquid at room temperature so it coats the tongue. Be sure to use fresh vegetable oil. Give it a sniff before using to make sure it doesn’t have any off flavors. Feel free to use melted coconut oil instead of vegetable oil! This recipe uses a combination of granulated and brown sugars, which creates a cake that’s flavorful, moist, and fudgy. The more whole eggs a cake recipe has, the richer it’ll be. Since the egg yolk contains most of the fat in an egg, it also lends richness to cakes. Adding an egg yolk to this recipe also helped increase the fudge factor. Be sure your eggs are at room temperature so they blend into the batter smoothly. This also adds such a lovely richness and balance of flavor to cake. Full fat plain Greek yogurt also makes a fine substitute if you don’t have sour cream. Be sure to use room temperature sour cream. This recipe uses my all time favorite frosting: Chocolate Swiss Meringue Buttercream. It is a little more advanced, but the result is a frosting so silky, smooth, creamy, and not-too-sweet that it’s 100000% worth the effort. The ingredients & directions are included in the cake recipe below, but I also have an entire step-by-step tutorial on how to make chocolate Swiss meringue buttercream here. I think the best part about this buttercream frosting is how easy it is to work with. It literally just glides right onto the cake effortlessly. Since it is so silky, though, it’s not the best frosting to use for any super intricate cake decorating. 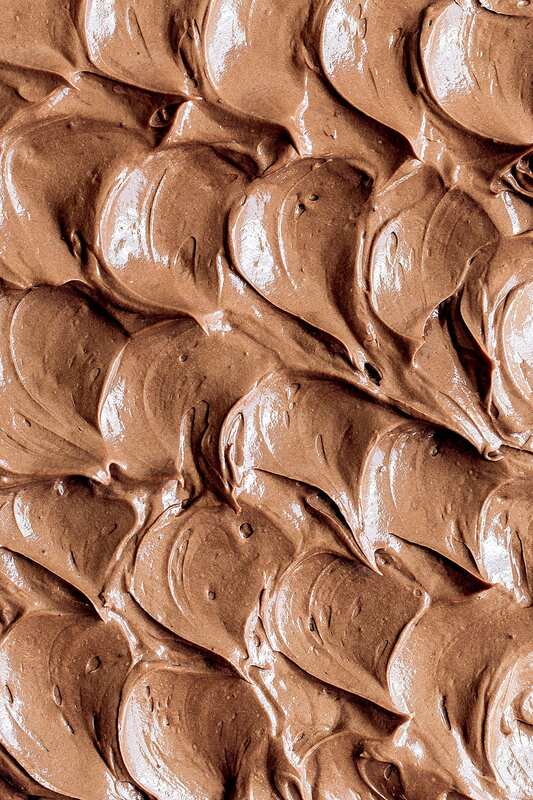 If you don’t want to make Swiss Meringue Buttercream, you could use make a double batch of this dark chocolate buttercream instead. You can wrap unfrosted un-cut cooled cake layers completely in several layers of plastic wrap. Place inside a freezer bag. Store at room temperature for up to 5 days, or in the freezer for up to 2 months. Defrost overnight in the fridge. Frosting can be made 1 day ahead of time and stored in an airtight container in the refrigerator. Warm frosting in the microwave for 5 to 10 seconds and stir until creamy again before frosting cake. Frosting can also be transferred to a ziptop bag and frozen for up to 1 month. Defrost in the fridge overnight then rewhip in the stand mixer until light and smooth. 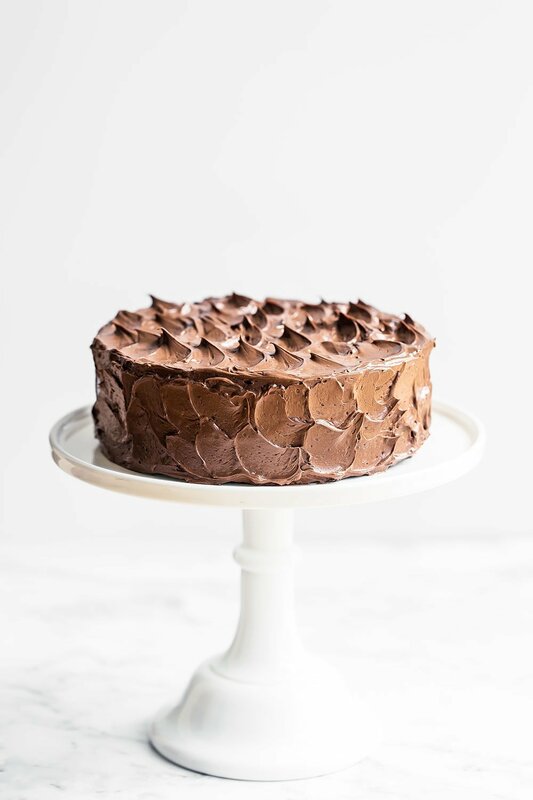 Since frosting acts as a protective seal that keeps the cake moist and fresh, frosted cakes can be stored at a cool and dry room temperature for up to 2 days. Cover with a cake keeper to keep the frosting intact. Don’t use plastic wrap, which will not only ruin your frosting but also create condensation that can cause the frosting to separate. I personally don’t worry about keeping frosting at room temperature since the sugar acts as a preservative, but if this concerns you then just keep the cake in the fridge. How Can I Turn This Into Cupcakes? Lucky for you, I already have a best ever chocolate cupcake recipe here! It’s the same base as this recipe. In a medium heatproof bowl add the chocolate, cocoa powder, and espresso powder. Pour hot water over mixture. Cover and let stand for 5 minutes. Whisk mixture gently until smooth then set aside to cool. Meanwhile, preheat the oven to 350°F. Butter and flour two 8-inch round cake pans. In a small bowl, whisk together the flour, sugars, salt, and baking soda. Whisk sour cream, oil, eggs, egg yolk, vinegar, and vanilla into the cooled chocolate mixture until smooth. Stir in the flour mixture until smooth, being careful not to overmix. Pour the batter into the prepared pans and bake for 35 to 40 minutes, or until a cake tester comes out clean. Cool in the pans for 30 minutes, then carefully turn them out onto a cooling rack to cool completely. Combine the sugar, egg whites, and salt in the bowl of a stand mixer. Set bowl over a saucepan filled with 1-inch of gently simmering water. Whisking gently and constantly, heat mixture until sugar is dissolved and mixture is slightly thickened and foamy and registers 150°F on a candy thermometer or a digital thermometer, about 3 minutes. Fit stand mixer with whisk attachment and beat the egg white mixture on medium speed until slightly cooled and thickened, about 2 minutes. Add the butter, 1 piece at a time, until smooth and creamy. If the mixture looks curdled, that’s okay. Just keep beating until it becomes smooth. If the butter becomes too warm and greasy, refrigerate the bowl for 10 to 15 minutes then continue to beat until smooth. Add chocolate and vanilla and mix until combined. Increase speed to medium-high and beat until light, fluffy, and well combined, about 30 seconds, scraping down the sides of the bowl as necessary. Place one cake layer on a cake turntable or cake stand. Spread an even layer of frosting all of the cake layer, pushing it out over the edge just slightly. Place the other cake layer upside-down on top of the frosting so that the top of the cake is nice and flat. With an offset spatula, spread the remaining frosting evenly all over the cake, smoothing the edges. Serve or cover and store in the fridge for up to 2 days. Let come to room temperature for an hour before serving. If you don’t have espresso powder, you can use 1 cup hot coffee in place of the powder + boiling water. This recipe uses vegetable oil, make sure it’s fresh and doesn’t have an off smell before using. Can I substitute a soy or coconut milk yogurt for the sour cream to make it dairy free? For allergies, I was happy to see the oil and not butter. Thanks! I haven’t tried that. If you give it a shot let us know how it turns out! Hi Tessa. 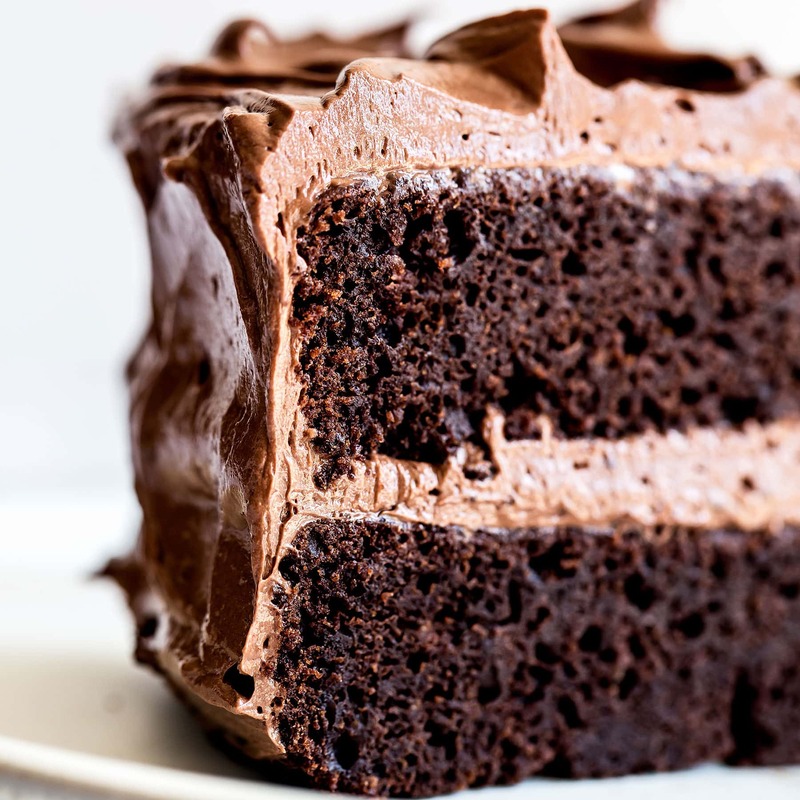 Your Best Chocolate Cake recipe looks amazing and I will try it when I have company in a couple of weeks, but my husband and I aren’t big chocolate lovers. Do you have a Best (other flavor) Cake recipe that is moist, not too sweet, but delicious? Maybe lemon or caramel or plain perfect white or yellow? The frosting, too, please. The swiss butter cream looks wonderful. Thank you! I very much enjoy your baking show. This looks amazing! I plan on making this for an upcoming family birthday. Quick question – if I wanted vanilla cake instead, would I just omit the chocolate and espresso in the recipe? Hi Josh, no this recipe was specifically formulated for chocolate. I would just find a vanilla cake recipe! I made this on the weekend. There is only a quarter left it was soooooo good. I have been hunting for a recipe for a while & have just found it. Thankyou so much. I put chocolate shavings to decorate. I found the Swiss meringue soft to work with so put the cake in the fridge to ‘set’. Worked a treat. The most flavorful, moist, and tender chocolate cake ever!!! I loved your chocolate cake and thank you so much for sharing this amazing recipe. Hi! What brand of chocolate do you like to use for the cake and frosting? Is it better to use APF than cake flour in this recipe? Have you tried this recipe with cupcakes instead of a cake? Tessa, I live in north of Brazil and it’s too difficult to find sour cream. Could I substitute for yogurt or other ingredient? Hi. I do not have time to search for Dutch Process Cocoa. Can I just use Hersheys dark cocoa? do you have to use the white wine vinegar? whats it for? My oven fits only one round cake pan at a time. Should I split the ingredients and create two batters, each ready before cooking or can I mix all the ingredients at once and cook the two cakes separately? Will the batter sitting uncooked for longer affect the quality of the second cake? Thank you! Hi Tessa, does this cake hold well under fondant? Would substituting Cake Flour for the AP make it even better? Thank you for this recipe! I could not believe how delicious this cake was. 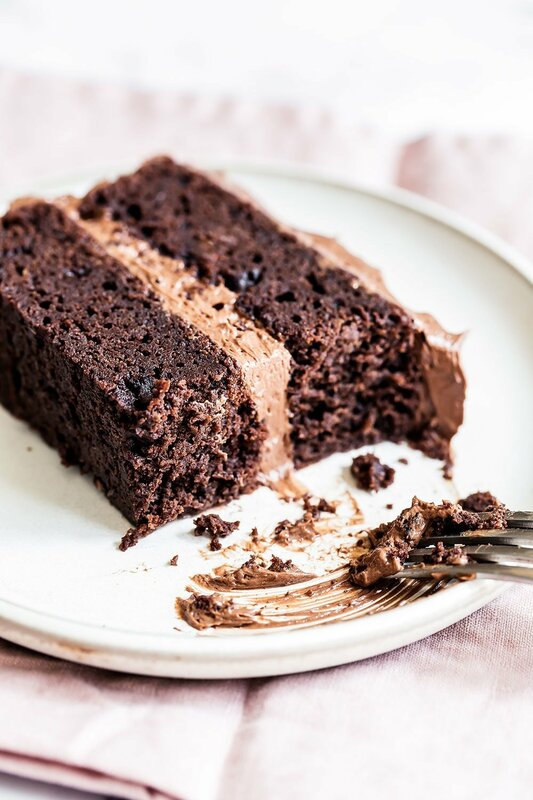 It’s the chocolate cake of my dreams. Since dutch process cocoa is alkalinized does the baking soda need two different acids (brown sugar and white vinegar) to activate or can I leave out the vinegar? Also how will the cake differ if I used natural cocoa instead of dutched? I baked your best chocolate cupcakes a while ago and absolutely loved them, so I was delighted when you released this recipe. Having baked many, many chocolate cakes in search of a go-to recipe, I have to say this one is it! The chocolate flavour is strong, one feature most recipes lack. The texture is not too dense nor too light and it is perfectly moist. Thank you Tessa for your efforts in creating the very best recipes! also, can this be made in a 9×13 pan. and what is the baking time.? This cake is in the oven now. My birthday is tomorrow. I made it in a Bundt pan with enough batter to make a fluted flan pan as well. It smells so good. I’m putting a chocolate cream cheese frosting on it. Please don’t be offended. Baker’s make it their own. I followed your directions to the letter. We’re down the street from you in Tucson. I just made your chocolate cake and my kitchen spells heavenly. Do you have any tips on how to cut the cake liner for the bottom of the pans a more efficient way? I also requested to join your Facebook group and still waiting to be accepted. Thank you for all your informative videos on YouTube. Hi, Tessa. Would you recommend this under fondant? Sounds like an amazing cake everyone will love at the party! The cake looks yummy, would definitely want to try this recipe. Could you suggest an egg substitute for this recipe? My mom and sis are allergic to eggs! Looks amazing- can’t wait to make this for my hubby on Vday. If I wanted to make cupcakes instead, how would the bake time change? Hi! Looks like a great recipe! Have always wondered when using egg in frosting recipes where egg isnt really cooked, is it safe to eat? Can you get salmonella from that kind of frosting?? What cooks the egg whites? Thanks! Made this with natural cocoa powder instead of dutch. Kept the baking soda but omitted the vinegar. Baked 40mins, came out PERFECTLY. 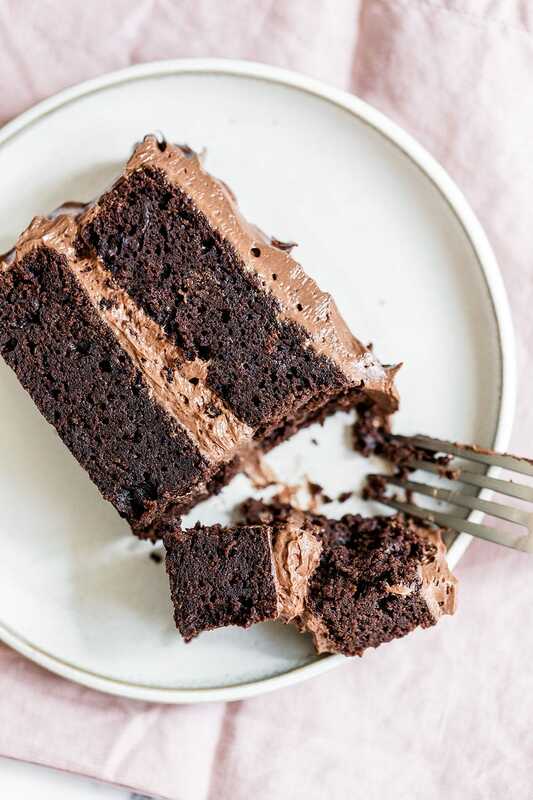 10/10 would recommend, this will now be my forever go-to chocolate cake recipe! Hi Carol – did you see this line in the recipe? “If the butter becomes too warm and greasy, refrigerate the bowl for 10 to 15 minutes then continue to beat until smooth.” That will also help thicken it up then you can continue beating until it’s the right consistency.